Rough estimates put total ecommerce spending in 2016 at over $1 trillion dollars with anticipated double digit year-over-year growth. There’s no denying it – the worldwide ecommerce market is massive. This staggering growth put ecommerce companies in a promising and challenging situation. With approximately 24 million ecommerce stores selling products online, competition is fierce. So how do you stand out in the sea of ecommerce? How do you make the best possible business decisions for your organization around product selection and pricing? Four words – data driven decision making. Traditionally, ecommerce merchants have relied on manual processes to collect and analyze key data points. Beyond the obvious challenge of resources and time, this approach can lead to inaccurate calculations which in turn, result in inaccurate decision making. The results – low sales volume, low margins and heavy overstock fees (recent research shows overstock and out-of-stocks cost retailers $1.1 trillion in lost revenue last year). The stakes are too high for merchants to rely on ‘best guess’ case scenarios. To be successful today, merchants need quick access to key data that will them make the most informed decisions possible. With access to actionable data, ecommerce merchants can quickly optimize profitability and see exponential growth in their business. One of the key benefits of product market data is that it often uncovers untapped demand in different marketplaces or regions of the world that the seller didn’t previously consider. Backed with accurate, real-time data, ecommerce sellers can confidently choose the right market and the right products, understanding exactly what kind of profits they can expect to see. But what’s the best way to collect this critical data? There are many platforms in the marketplace that automatically aggregate data, eliminating the manual work and reducing the unknown factors that leave ecommerce merchants with little choice but to flip a coin and hope for the best. 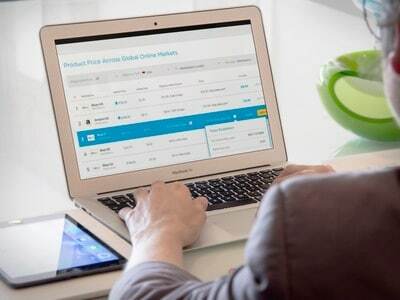 With Algopix, ecommerce sellers are able to make informed business decisions based on accurate analyses of the most critical variables associated with selling online. Real prices. Using an automated analysis tool like Algopix, you can instantly see the real prices for products across eBay and Amazon. Related costs. Selling products online can be expensive and it can be even more expensive when you’re not able to understand the bigger picture. Within minutes, product market analysis providers like Algopix can provide a comprehensive breakdown of all of the related costs you can expect to incur, including selling fees, shipping costs, taxes and more. Country-specific sales stats. Your product may not be as popular stateside as it is in other countries around the world. Automated product market analysis will reveal the sales segmentation for your product according to country and marketplace, so you can identify the better opportunities that might exist elsewhere or on different channels. Interest over time. With graphs charting a product’s popularity over time, you can quickly deduce whether a product is at the beginning or end of its lifecycle and whether it makes sense to start or continue selling it online. Take the time to do your research. Being backed with real, accurate insights into product performance, merchants can cross borders and grow their business internationally in no time—bringing profits to new, previously unattainable heights.